Today marks the end of a large part of our battle. Today he gets his last dose of IV chemotherapy. 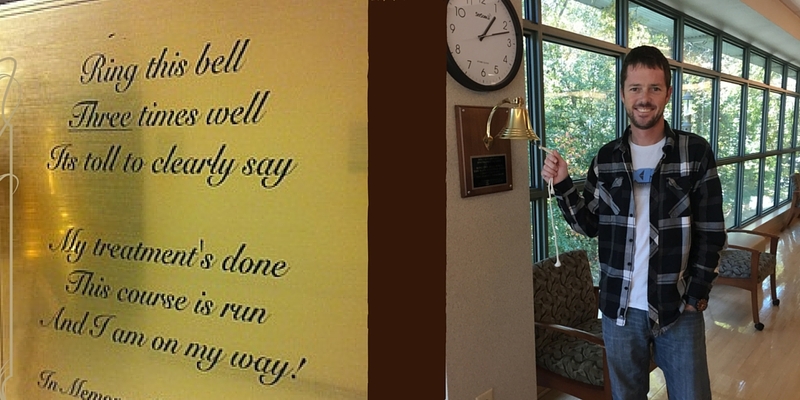 Today he gets to ring the bell that signifies the passage to the next part of the journey. That bell hangs on the wall across the room. I have been staring at that bell for an entire month. I have watched so many others take their turn all the while longing for it to be his. I have clapped, cheered, and eaten cupcakes in celebration of their journeys. I have rejoiced with them in earnest sincerity. But today….today is finally HIS day. This man who has endured unimaginable suffering without ever uttering a single complaint. This man who received 19 doses of chemotherapy in just 24 days. This man who thanked me several times a day for “all that I was doing.” This man who said “God knew what he was doing when he gave me cancer because I couldn’t handle all the things you are juggling”. This man who suffered fever so high he was involuntarily twitching and jerking. We had to pack icepacks and bags of frozen peas around his body to keep him below the temperature threshold that would require a trip to the Emergency Room. This man who was barely able to speak scratched out the almost inaudible words “One more week”. He never wavered, never questioned. This man is a rock. It was so daunting in the beginning. So overwhelming I couldn’t catch my breath. There were days when the lump in my throat never dissolved and just grew larger as the hours grew longer. There were a few dicey weeks when I wasn’t sure we would survive. And then it settled in. And it became the new normal. We learned how to minimize and medicate the side effects to the best of our ability. We became amateur pharmacists experimenting with combinations of heavy narcotics to get the best results. We learned to be humble and gracious while accepting meals, yard work, carpools, and countless other kindnesses. We relied on our survival instincts and the days and weeks became a blur of one foot in front of the other. It was like living underwater. The world around us continued to move but all the sounds were muffled and the visions blurry. Our reactions slowed and our senses dulled. Then I blinked and it was over. And the tears flowed down my face. And the crushing relief washed over me. And all of the things I hadn’t had time to feel before suddenly had a space. And I exhaled for the first time in 24 days. Next week we begin the second part of our journey. We start chemotherapy injections that he will take 3 times a week for the next 11 months. This morning I sat by his side and practiced over and over drawing up syringes and injecting saline into a dummy model. My hands shaking at every step and the bile rising up in my throat as I imagined jabbing the needles into his belly instead of the dummy. But I know that this too will settle in. I am stronger than I ever imagined. And he is stronger than I ever imagined. And where there was once earth shattering doubt and fear there is now only resolve. Today we close this chapter. And he rang that damned bell. <3 All my thoughts, always! YAY for this chapter in your lives to be closed. Moving on to the next. God definitely knows what he is doing when obstacles are put on each of and placing the best possible husband/wife by our side to be our strength, cheerleader and personal pharmacist. We will continue to pray for you all and I know that you have an abundance amount of support surrounding both of you but if there is anything else that you guys need please let us know. I know we live on the other side of Guam, lol, but please let me know. Even if it is just for somebody to come sit with you so you can have an outlet. We love you guys! I love and adore you and miss you dearly. I can’t wait for our lunch in a few weeks!!! Oh ashford! This is just beautiful and amazing and I want to hug your whole family. Continuing to pray for you all as you enter this next phase of the journey. Thank you so much! I am humbled by all the people loving on us these past few months. Your post also rings a bell, and sets the rest of us free to cheer, and cry, and pray even more fervently. Much love from us to you, David, and your children. You are stronger than you ever imagined. I’m so sorry that you are both going through this but I know so many people who have been down the same path that I can see the light at the end of the tunnel for you. Sending lots of hugs & strength. I couldn’t have written it better myself… Well said… I watched my husband go through it last August… finished last shot in July. Praying it worked every day! Words are not enough to let you know how much we care about your family. WE love you so much!